30 years ago, I paused a 5-year love of D&D to attend college. About six months ago, I picked it up again with my adult sons, who’d gathered for my birthday. We started with $20 on the D&D 5e Starter Set, which includes everything you need for a group to play: a subset of the 5th Edition D&D rules, a starter module, a set of pre-rolled characters and dice. My youngest son had learned all of the rules watching Critical Role, so I lead the interactive story telling as the DM, asking him for the specific mechanics as needed. We had a blast. I can’t tell you how many hours of joy we got for $20 (although of course that lead to much more money spent shopping for the perfect dice, buying the full set of 5e rules, spell chards, etc.). However, we ran into two classes of problems with the paper & pencil play: 1) it only really works if you’re all together in the same room (my sons are normally spread between three cities) and 2) some logistical issues like progressive map reveal (aka “fog of war”) and managing encounters (i.e. initiative, HP, AC, attacks, damage, etc. I happen to be using a dedicated device for Google Hangouts, but we’ve also used a separate laptop that worked as well. The logistics problems were the same as when I played D&D in the ’80s, but I had less patience for them now that I know the power of software. So, I immediately started designing a solution in my head (as I am wont to do). However, as much as I enjoy writing software, I wanted to get back to playing faster than that! After some research, I found two main applications built to solve my RPG problems: Roll20 and Fantasy Grounds. Fantasy Grounds has a lot going for it and I know many people love it. However, there weren’t a lot of “getting started” videos that I found inspiring and it required the local installation of a 32-bit client app. That seemed a little backwards to me. Also, it cost money just to get started. On the other hand, Roll20 is web-based, has a ton of intro videos on YouTube and is free (of course, they have paid options, too)! The videos made it look great, so my local son and I tried a little mock battle. When that worked, we got the party together to try the free module that comes with Roll20. 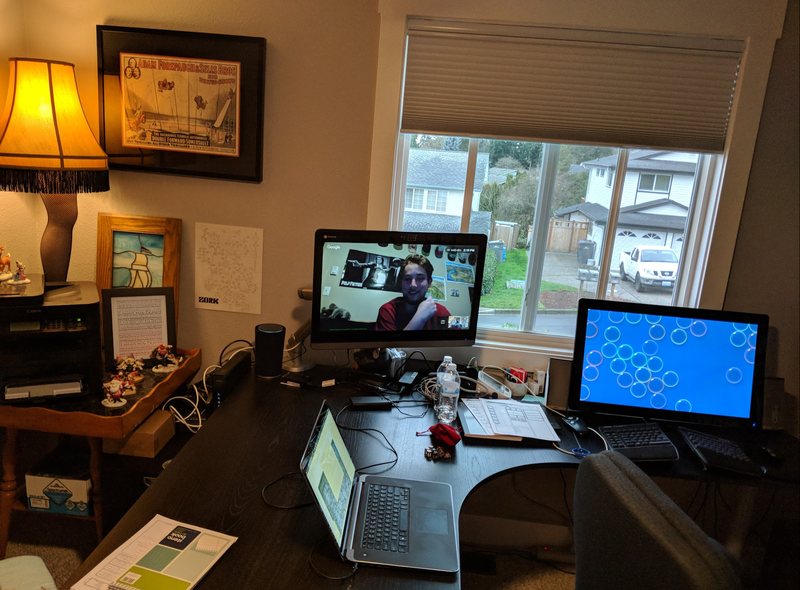 We lost an hour or so getting used to things, which is to be expected, but I swear we spent another whole hour trying the built-in video conferencing that comes with Roll20. In theory it’s great, as everyone shows up right on the game table, but in practice, it makes the whole app unstable as hell. I recommend turning it off completely and using a dedicated PC for video conferencing as we do. Some of the Roll20 controls are clunky, e.g. having to switch between select and drag mode when interacting with maps, and there can be some data entry when it comes to picking spells and the like. That said, we love Roll20. We’ve moved on from the free content (which ain’t great, but gave us the practice we needed) to the content you can purchase that’s been poured directly into the Roll20 format, including the maps, monsters, characters, NPCs, handouts, etc. My sons love to see the maps and where they are relative to the stuff in the room and the monsters. My favorite is being able to drag a monster or character onto the map, click on the “Initiative” link on the monster/character sheet, see the dice roll in 3D (the value is captured in the Turn Tracker) and keep track of who’s turn it is with a simple button click. Then, on each person’s turn, they can roll to attack by clicking on their weapon or spell, automatically showing advantage/disadvantage rolls (if needed) and damage, even lighting up the scores in red or green for critical hits or fumbles (the latter of which I manage with the separate iFumble app). Also, the built in fog of war mode and DM layer on the maps means that I can reveal things to the players as appropriate. Once you play with content specifically formatted for Roll20, you won’t want to go back. Pretty much all of the official 5e modules seem to be available, including the starter module which we bought again for $20 (and again, totally worth it). We’d already gotten about half-way through via paper and pencil, so our first session with real content was a great comparison. With the kinks worked out, we had a great time and even included my little brother who lives in a fourth city in another time zone. Since starting again six months ago, I’ve played with three groups of players, all of whom are composed mainly of adults that have little or no D&D experience. Certainly 5e D&D captures the flavor of 2e that I grew up on (aka Advanced D&D), so there’s no trouble transitioning beyond learning some different rules. I do prefer the character sheet management provided by D&D Beyond (the official logistics software provided by Wizards of the Coast), but it doesn’t provide online play like Roll20 or Fantasy Grounds. My dream is that WotC purchase Roll20, drop it into D&D Beyond, polish it up and charge whatever they need to keep it running. I’d pay! Of course, the main joy is the memories you build in the key moments of interactive story telling with friends and family. However you end up doing that, you can’t go wrong.